It's been reaffirming seeing Secretary of State after Secretary of State-- and not just from normal states but from deep red states like Mississippi and Louisiana-- standing up to Trump and pet fascist anti-democracy activist Kris Kobach and telling them to go jump into the Gulf of Mexico. The Trumpists want the voter roles and the Secretaries are protecting them from him and Kobach. It may not be the same as blowing up a Nazi troop train, but that's what I call Resistance! In an OpEd for the Times yesterday, Dale Ho, director of the ACLU's Voting Rights Project, warned Americans about what the Trump Regime is up to. "Last Wednesday, Kris Kobach, the secretary of state of Kansas and the vice chairman of the Presidential Advisory Commission on Election Integrity, wrote a letter to all 50 states, requesting that they send the commission the personal information of all registered voters. This includes full names, birth dates, addresses, political affiliations, voting history and last four digits of Social Security numbers. The letter says that all documents provided to the commission will be made public. What could possibly go wrong?" There are obvious data privacy concerns. Digital security experts have called the plan a gold mine for hackers. Mr. Kobach’s letter says the data will be held on a “secure FTP site,” but offers no details. Mr. Kobach himself appears to be backtracking, recently saying that, notwithstanding his request to other states, he will not be giving Kansas voters’ Social Security information to his own commission. 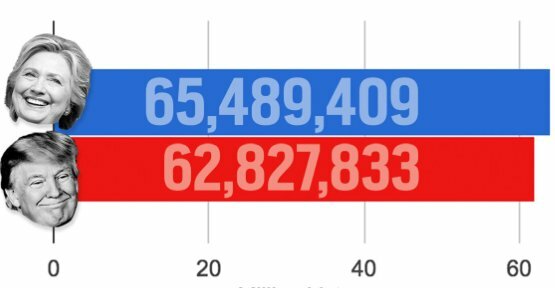 We know this because Mr. Kobach, the de facto head of the commission, is a champion of that lie: “I think the president-elect is absolutely correct when he says the number of illegal votes cast exceeds the popular vote margin between him and Hillary Clinton,” he told reporters last fall. This commission is not meant to ensure that America’s voter rolls are accurate. It is meant to disenfranchise voters. 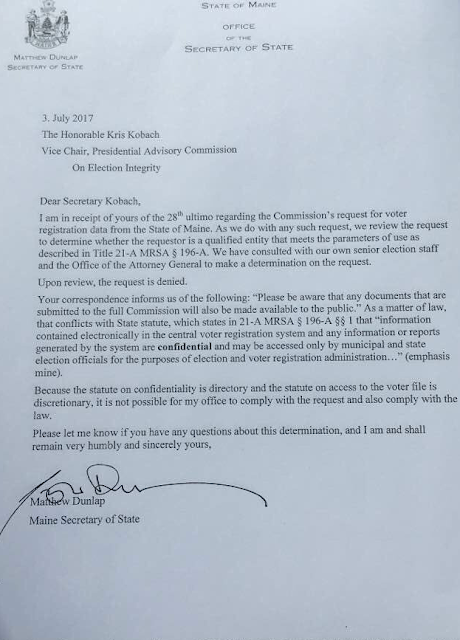 Mr. Kobach will most likely use your data to make exaggerated claims about untold numbers of people who are supposedly registered and voting in multiple states. For years, he has operated an “Interstate Crosscheck” system, which purports to compare voter rolls in about 30 states, in order to identify possible double registrants. This new endeavor looks like Crosscheck on steroids. Ensuring that voter rolls are accurate and up-to-date is a worthy goal. Comparing registration lists to find people who have moved can be a useful practice, but only if it’s done accurately and appropriate safeguards are built in, like giving voters notice and an opportunity to contest their removal in case they are mistakenly flagged. A reliable system that automatically updates voter rolls when people move could be an innovative way both to maintain the accuracy of rolls and to help voters participate without unnecessary bureaucratic headaches. Crosscheck considers two names to be matches based on very loose criteria, like first and last name, even if the Social Security numbers don’t match. That generates many false positives and might result in lots of people getting purged who are legitimately registered in only one state. Even if the commission does end up finding people who are registered to vote in more than one state, that fact is not, by itself, evidence of fraud. We have a decentralized elections system and we live in a mobile society. So it’s inevitable that some people will end up registered in more than one state. Just ask members of the president’s family and inner circle like Stephen K. Bannon, Steven Mnuchin, Jared Kushner and Tiffany Trump, all of whom were apparently registered in multiple states last year. In any event, once the commission manufactures its false headlines about widespread fraud, it will turn to recommendations. There are two things to worry about. It will probably call for removing voters from rolls. But dubious information about people who may have moved from one state to another should not be the basis for this. To take one example, last year, the A.C.L.U. and our co-counsel Demos challenged a process used by Ohio that marks voters for removal if they have failed to vote in two years. The idea is apparently that failing to participate even in a single midterm election, which more than half of registered voters typically fail to do, constitutes evidence that a voter may have moved. The United States Court of Appeals for the Sixth Circuit disagreed and halted the practice, which prevented the state from throwing away 7,500 ballots in the 2016 election. The Supreme Court will review the case in the fall. For more than 20 years, the Department of Justice has consistently argued that such purges based on nonvoting are illegal, and has threatened legal action against states that do not follow the law. But it wouldn’t be shocking if the commission comes out in favor of unreliable purges like Ohio’s. And the Trump administration might make the Justice Department an accomplice in such efforts by reorienting the priorities of the Civil Rights Division away from protecting voters, in favor of actively supporting states’ efforts to cull the registration lists. That’s the opposite of elections integrity, which requires making sure that eligible voters are not kicked off the rolls. We can also expect new proposals to limit access to the ballot. 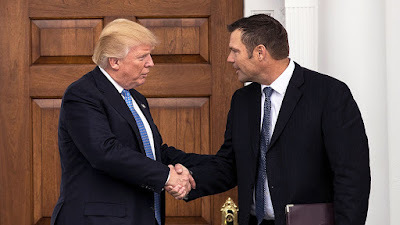 During the presidential transition, Mr. Kobach was photographed meeting with Mr. Trump and carrying a document that appeared to propose amending the federal motor-voter law, a document that he has refused to make public. That’s alarming: The motor-voter law has been a critical bulwark protecting voters’ rights against Mr. Kobach’s schemes, including his “show me your papers” law that requires voter registration applicants in Kansas to provide a citizenship document like a passport or a birth certificate when registering to vote. That requirement makes voter registration drives all but impossible, as very few people carry such documents around with them, and fewer are likely to share them with strangers. It seems probable that the commission is a Trojan horse for the Trump administration to propose changes to the federal law that has stymied Mr. Kobach’s voter suppression agenda, and thus allow him to replicate it nationwide. Fortunately, elections officials in more than 20 states have announced that they will either not comply at all or refuse some aspects of Mr. Trump’s demand for our data. Mr. Trump has implied that these states are up to no good, asking in a tweet, “What are they trying to hide?” That’s pretty rich, given that Mr. Trump has so far failed to make the names of the commission’s staff public and that the commission’s “organizational call” was convened without public notice and was not open to the public. The Mississippi Republican secretary of state, Delbert Hosemann, said on Friday that the commission can “go jump in the Gulf of Mexico.” Voters in all other states should demand a similar response from their elections officials, who should refuse to participate in this charade. Our elected officials should be doing everything they can to preserve and advance the right to vote, not endanger it. • Alabama- Secretary of State John Merrill: "This office will not share any information not already available to the public." • Alaska- Lt. Gov. Byron Mallott: "State law allows only some information to be public. Public information does not include: last four numbers of SSN, date of birth, or residence address." • Arizona- Secretary of State Michele Reagan: "We will only make available the same redacted information that is available to the general public through a public records request. Social security numbers, Date of Birth and identifying information such as Mother's maiden name will not be transmitted. Arizona's voters can expect to have their personal information remain private and safe." • Secretary of State Alex Padilla: "I will not provide sensitive voter information to a commission that has already inaccurately passed judgment that millions of Californians voted illegally. California's participation would only serve to legitimize the false and already debunked claims of massive voter fraud made by the President, the Vice President, and Mr. Kobach. The President's Commission is a waste of taxpayer money and a distraction from the real threats to the integrity of our elections today: aging voting systems and documented Russian interference in our elections." 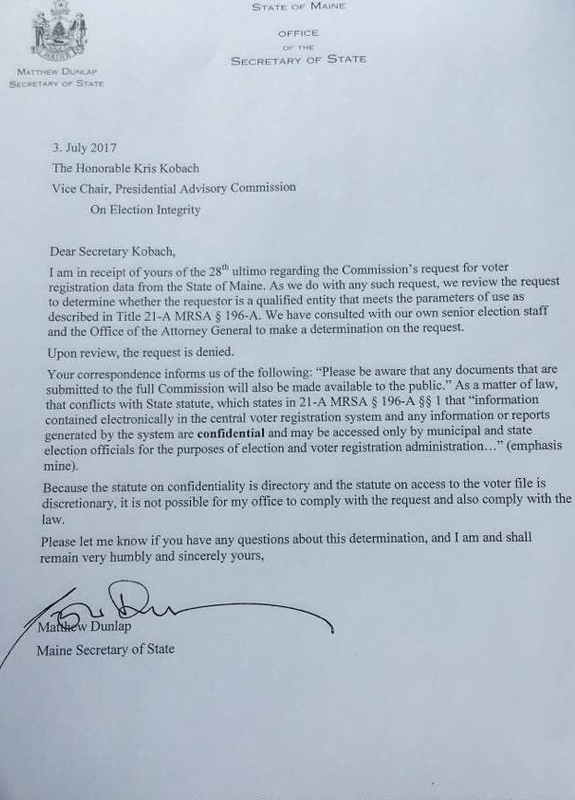 • Connecticut- Secretary of State Denise Merrill: "Given Secretary Kobach's history we find it very difficult to have confidence in the work of this Commission." • Delaware- State Election Commissioner Elaine Manlove: ""Releasing this information to the White House would not serve the mission of safeguarding the fairness and integrity of elections in Delaware and would not be in the best interests of Delaware voters." • Georgia- Press Secretary Candice L. Broce: "The Georgia Secretary of State's Office will provide the publicly available voter list. As specified in Georgia law, the public list does not contain a registered voter's driver's license number, social security number, month and day of birth, site of voter registration, phone number, or email address." • Idaho- Secretary of State Lawerence Denney: "We are interpreting this as a public records request from the Commission. As such, Idaho law requires me to respond ONLY with the non-exempt public records available under the request." • Indiana- Secretary of State Connie Lawson: "Indiana law doesn't permit the Secretary of State to provide the personal information requested by Secretary Kobach." • Iowa- Secretary of State Paul Pate: "[P]roviding personal voter information, such as Social Security numbers, is forbidden under Iowa Code." • Kansas: Kobach's own spokeswoman Samantha Poetter: "Only 'publicly available' information will be shared with the Commission." • Kentucky- Secretary of State Alison Lundergan Grimes: "I do not intend to release Kentuckians' sensitive personal data to the federal government... [Señor Trumpanzee] has repeatedly spread the lie that three to five million illegal votes were cast in the last election. Kentucky will not aid a commission that is at best a waste of taxpayer money and at worst an attempt to legitimize voter suppression efforts across the country." • Louisiana- Secretary of State Tom Schedler: "My response to the Commission is, you're not going to play politics with Louisiana's voter data, and if you are, then you can purchase the limited public information available by law, to any candidate running for office. That's it." 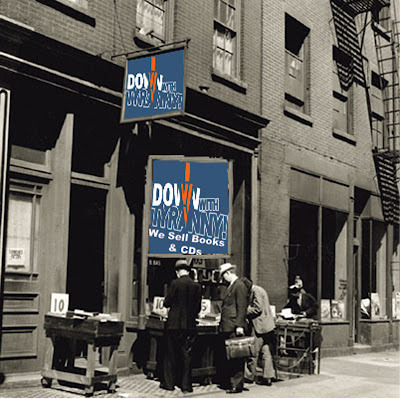 • Maine- Secretary of State Matthew Dunlap: "Maine citizens can be confident that our office will not release any data that is protected under Maine law, to the commission or any other requesting entity." 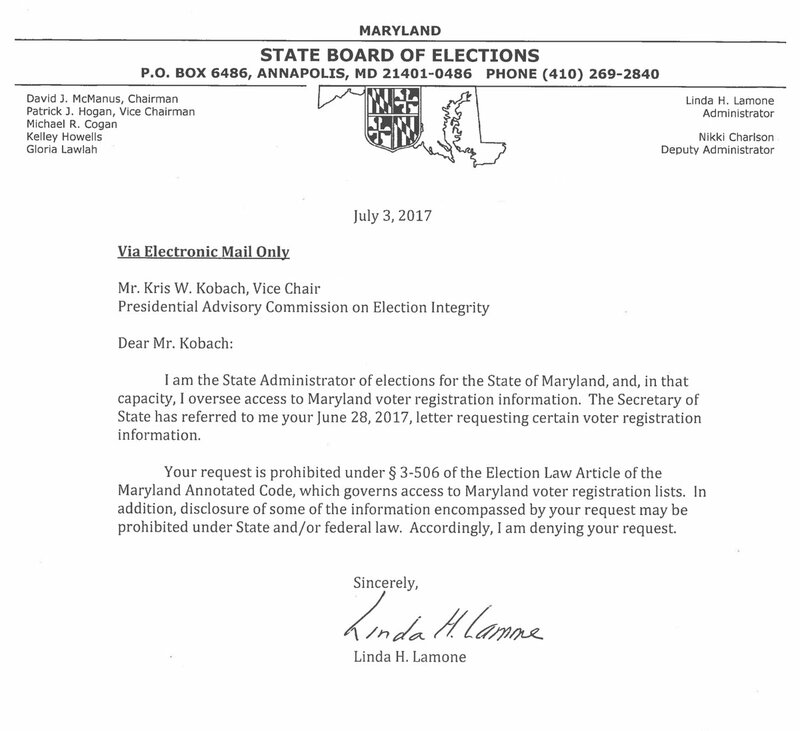 • Maryland- Attorney General Brian Frosh: "I find this request repugnant; appears designed only 2 intimidate voters and 2 indulge the President's fantasy that he won the popular vote." • Massachusetts- Communications Director Brian McNiff: "The state's voter registry is not a public record and information in it will not be shared with the Presidential Advisory Commission on Election Integrity." • Michigan- Secretary of State Ruth Johnson: "Michigan will certainly not go beyond what is legally required in any response to this data request, and we are highly sensitive to people's desires to keep what is private as private." • Minnesota- Secretary of State Steve Simon: "I have serious doubts about the commission's credibility and trustworthiness. Its two co-chairs have publicly backed President Trump's false and irresponsible claim that millions of ineligible votes were cast in the last election. They, along with other recent appointees, appear to have a strong interest in steering the commission toward their predetermined conclusions and outcomes. I fear that the commission risks becoming a partisan tool to shut out millions of eligible American voters." • Missouri- Secretary of State Jay Ashcroft: "We will protect Missourians' private information." • Montana- Director of Elections Derek Oestreicher: "Secretary of State Corey Stapleton won't release voters' birthdays or Social Security numbers to the president's commission." • Nevada- Secretary of State Barbara Cegavske: "While this request has understandably raised concerns with privacy advocates, voter registration information in Nevada is generally available for public inspection... Election officials in Nevada do, however, collect certain information that is not considered a public record under state law and is therefore not available for public inspection. This information includes: Social Security Number; Driver's License Number; DMV Identification Card Number; and Email Address." • New Hampshire- Secretary of State Bill Gardner: "People have the right to purchase it, only what's public by law." • New Mexico- Secretary of State Maggie Oliver: "I will never release the personally identifiable information of New Mexico voters protected by law, including their social security number and birthdate. Further, I will not release any other voter information like names, addresses or voting history unless and until I am convinced the information will not be used for nefarious or unlawful purposes, and only if I am provided a clear plan for how it will be secured... It seems to maybe be a fishing expedition or a witch hunt of some kind and I'm very concerned about that." • New York- Governor Andrew Cuomo: "New York refuses to perpetuate the myth voter fraud played a role in our election. 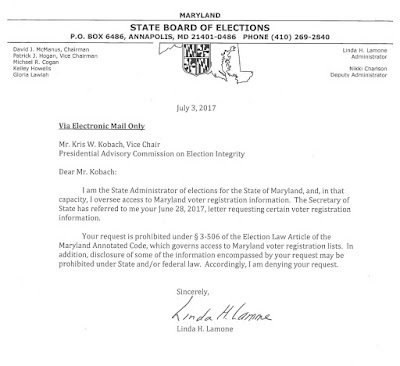 We will not be complying with this request and I encourage the Election Commission to work on issues of vital importance to voters, including ballot access, rather than focus on debunked theories of voter fraud." • North Carolina- Gov. Roy Cooper: "My staff has told the State Board of Elections that we should not participate in providing sensitive information beyond what is public record as it is unnecessary, and because I have concerns that it is an effort to justify the President's false claims about voter fraud." • Ohio- Secretary of State Jon Husted: "[W]e do not want any federal intervention in our state's right and responsibility to conduct elections." • Oklahoma- Bryan Dean, public information officer for the Oklahoma State Election Board: "Full or partial Social Security numbers are not publicly available under Oklahoma law." • Oregon- Secretary of State Dennis Richardson: "Oregon policy prohibits disclosure of some of the information you requested, such as social security numbers and drivers' license numbers." • Pennsylvania- Gov. Tom Wolf: "I have serious reservations about the true intentions of this effort in light of the false statements this administration has made regarding voting integrity, the historical suppression of voting rights, and the way that such data has been used in the past." • Rhode Island- Secretary of State Nellie Gorbea: "I will safeguard the privacy of Rhode Island voters and respond only with data that is already publicly available." • South Dakota- Secretary of State Shantel Krebs: "[We] will not share voter information with the commission." • Tennessee- Secretary of State Tre Hargett: "Tennessee state law does not allow my office to release the voter information requested to the federal commission." • Utah- Lt. Gov. Spencer J. Cox: "There has been no evidence of mass voter fraud in Utah and we look forward to helping the federal government better understand the steps we have taken to ensure the security and validity of Utah's elections." • Vermont- Secretary of State James Condos: "There is no evidence of the kind of massive fraud alleged by President Trump, Vice President Pence or Secretary of State Kobach. I believe these unproven claims are an effort to set the stage to weaken our democratic process through a systematic national effort of voter suppression and intimidation. ... My focus is to protect Vermont citizens from bogus attacks on our democracy. I will not release any more information about Vermont voters than is available to any citizen requesting our voter file." • Virginia- See Governor McAuliffe's statement of Resistance above. • Washington- Secretary of State Kim Wyman: "Info that is NOT public record=your SS# (even last 4), DL #, phone #, email, language preference. We ensure this info remains private." • West Virginia- Secretary of State Mac Warner: [W]e would never release Social Security numbers." • Wisconsin- Michael Haas, administrator of the Wisconsin Elections Commission: "State statutes permit the WEC to share confidential information in limited circumstances with law enforcement agencies or agencies of other states. The Presidential Commission does not appear to qualify under either of these categories." • Wyoming- Secretary of State Ed Murray: "I'm going to decline to provide any Wyoming voter information. It's not sitting well with me... Elections are the responsibility of states under the Constitution. I'm wondering if this request could lead to some federal overreach... I have not experienced any secretary of state who has expressed any concerns or worry about fraud or some type of nefarious activity occurring that jeopardizes their respective election process." Maine's Secretary of State is a member of Trump's commission! And now they're being sued for this lame idea. R intimidation of candidates, of both persuasions, has also begun. Pelosi/scummer intimidation of progressive candidates is also ongoing. If you can, keep good people from voting. If you can't, keep good people from running. If you can, do both. "Trump's voter suppression efforts" are NOT new nor original. They ARE the "federalization" of GOP democracy-destroying, strategy & tactics identifiable since a mid-80's court order against one aspect of them. "Crosscheck" is the current embodiment of the effort (of which we are aware). IT is the reason for Trump having been elected, NOT you-know-who-alleged-devil. Crosscheck "purports to compare voter rolls in about 30 states." Do you think, these are the 30 states essentially controlled by the GOP? The list of Secretary's of State include many of those 30 states. Apparently the GOP insists that voter suppression should be under "local control." What appears to be the obliteration of whatever democracy the US may have achieved has been a bipartisan effort.